32 Degrees is an activewear clothing company that focuses on providing functionality and style for the everyday wardrobe. 32 Degrees’ goal is to revolutionize the everyday basics by utilizing the latest warming and cooling technologies to deliver all day comfort throughout all seasons at a valued price. 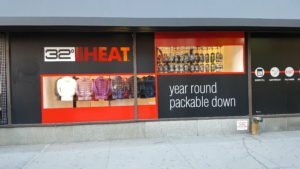 PACLINE Overhead Conveyors was contacted by 32 Degrees to help with a creative storefront marketing display in Manhattan, New York in the Macy’s department store near Times Square. The customer saw our Garment Handling Systems used in retail displays and realized that we could offer the exact solution they had envisioned. 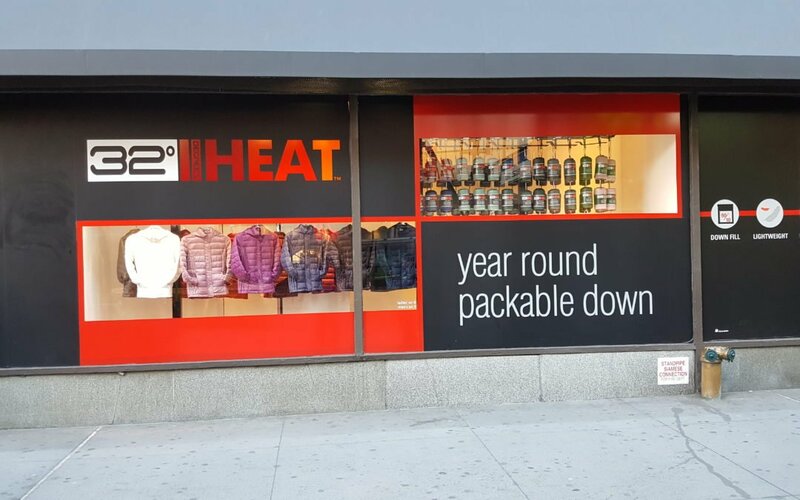 The month-long window display would feature their 32 Degrees “Heat” jacket that is pack-able into a small, convenient bag. Utilizing the PAC-LINE™ Overhead Conveyor allowed 32 Degrees to demonstrate the pack-able capability of their jacket with an interesting and eye-catching effect. The limited storefront space was PACLINE’s greatest obstacle throughout the design and install process. In order to fit the conveyor loop into the 3’ wide room, 9” radius curves had to be used, making the total storefront display conveyor only 18” wide! Our installers Mike and Spencer had to work overnight to install all equipment. They had to work and maneuver inside the tight window space along with all of their tooling and equipment making this the most congested job-site ever! 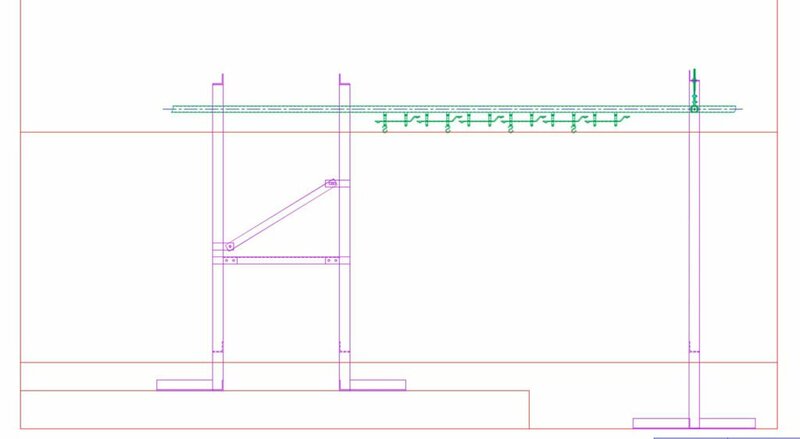 The blueprints of the storefront area display the limited room size and narrow width of conveyor. The PAC-LINE™ Monorail Enclosed Track Conveyor is often secured using a connection to the ceiling structure, or bolted to the floor using floor stands with baseplates. Unfortunately, the storefront room at Macy’s made these options unavailable, so project engineer, Yuvraj, was forced with the task of creating a different method of stabilizing the storefront display conveyor within a 3-week timeline. Yuvraj designed floor stands that were secured to one another, each with wide “X” style base plates in order to ensure stability and support. This resulted in a conveyor system that was not secured to any exterior supports, but was able to stand stable and still withstand any vibrations of the running conveyor. The unique floor stands enabled the storefront display conveyor to be stable and supported without bolted connection. Due to the overnight installation time limitation, the VFD could not be set up and wired during this process. This forced PACLINE to pre-wire and configure the VFD prior to shipping in order to reduce installation time and prevent potential installation issues from occurring. The pre-wired VFD was given a simple plug-in power unit so that the system could be easily managed and installed on-site. This made the installation very efficient, while keeping the VFD compact and hidden from outside viewers. The overnight installation was accomplished thanks to PACLINE’s experienced installers, who were able to install the system and deliver the requirements in a short time span in busy Manhattan, New York. To achieve the desired effect in the display, the PAC-LINE™ overhead conveyor was set up as a two-tiered system with loose jackets on the bottom hanger and packed jackets on the top. Portions of the top and bottom were strategically blocked from view with window graphics so that the hanging jackets appeared to be transforming before your eyes into packed jackets. The loose jackets were set up to turn 45 degrees in order to display the full jacket to the viewer and to ensure the jackets were conveyed smoothly without rubbing or becoming caught on any outer obstacles in the small storefront. The project engineer was able to create a hanger solution in order to achieve 32 Degree’s needs. 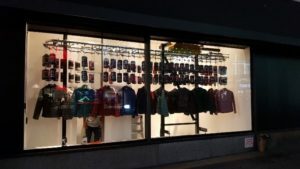 The final project displayed a moving storyline of jackets that appeared to become “packed” jackets as they were conveyed through a “machine” in the center of the window. 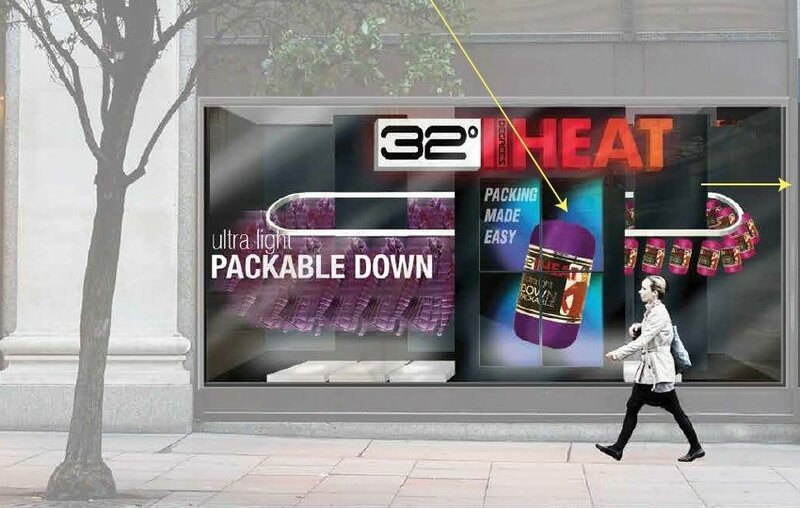 This creative window display was highly effective in catching the attention of passers-by on a busy Manhattan street AND demonstrating the unique features of the packable 32 Degrees “Heat” Jacket. For more information about our systems contact a PACLINE engineer at 1-800-955-8860.